It's not very often to see me in this busy stretch in Singapore at this early hour, but here I was at the Ngee Ann City (commonly known as "Taka" after its anchor tenant - Takashimaya SC) for the Tiger Street Football 2011 tournament. The "Local Competition" already started upon my arrival at the venue when the 32 teams slogged against one and other on a knock-out format with matches played inside the specially constructed oval-shaped enclosed playing field. The action from those matches I seen had been defined as "Singapore-styled" futsal at its best like those I seen in the past few events I had blogged. At the end of the first day, 'On The Run' (pictured above -photo credit: APBS) emerged as the champions of the Singapore leg after defeated 'La Plata Jr B' following a hard day at work to represent the Republic in the Grand Final to be held in Kuala Lumpur in September. “Playing in the oval cage (pictured above) was a unique experience and it made the matches intense and brought the best out of everyone who competed today. We look forward to representing Singapore in the Tiger Street Football Grand Finals and hopefully we will achieve even more success!” added the 28-year old. These two Singaporean finalists also got themselves a chance to pit their skills against four top foreign futsal teams in the "International Competition" of this two-day event on the following day. 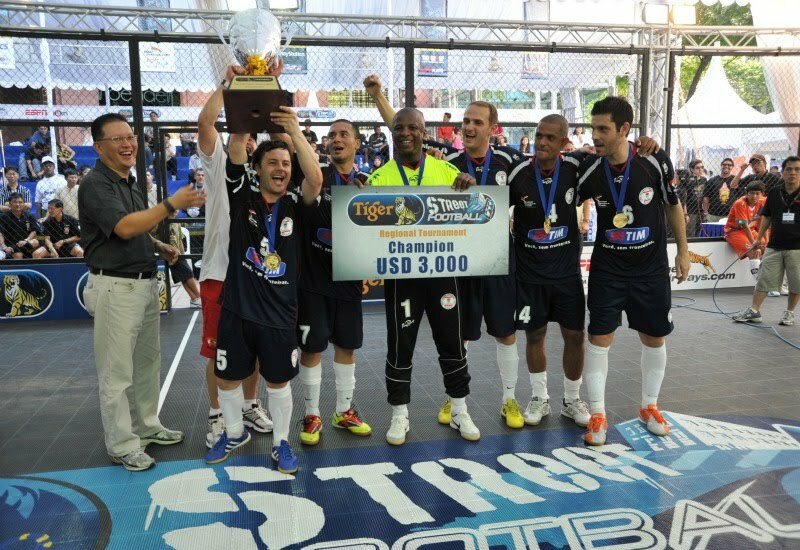 (Pictured above) 'La Plata Jr B' (in stripes) is another Singapore representative in the "International Competition"
And what a courageous performance by the newly-crowned Singapore champions, as they were at one stage on level term with leading Brazilian futsal team, ADC Florianopolis before losing out 4-3 in the end. The team from the South Brazil eventually went on to beat another invited team, Thai Son Bac Futsal Club from Vietnam 5-4 to win the Sunday tournament that saw participation of teams from England (Manchester Futsal Club), Thailand (GH Bank RBAC Futsal Club) and the two mentioned two Singapore sides. It had been quite an experience for the Brazilians to play in an enclosed pitch, said the team captain Denison Cabral (pictured above lifting the trophy) after the match:"We faced strong opposition today and the oval, caged pitch created a new competitive experience for us. Tactically, we had to adapt to the conditions whilst maintaining our usual playing style and we are delighted to have finished as champions! The 37-year old also lauded the performance of their Singapore opponents for putting up a credible performance. "We knew 'On The Run' are a great side from the way they won the local competition yesterday (Saturday's "Local Competition") and we expected a tough match that they brought the best out of us and hopefully more football players here recognise the potential they have through tournaments such as Tiger Street Football in the future." added the midfielder. (Pictured above) 'Deaf United' (in yellowed outfit) overcome their disability to complete with the rest of the 31 teams on level term. But it was not all about futsal, as promised by the organizers as various booths were set up to keep the players or any passer-by along the stretch to have fun in games ala carnival style such as "Dart Live" and "Sony PS3" (both pictured below). The unique collaboration of having street football infused in the fun carnival atmosphere had certainly achieved its motive of having the both elements work hand in hand together, much to the delights of the organizers. 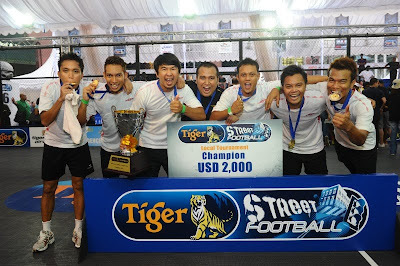 “We are delighted with the success of the first ever Tiger Street Football tournament here in Singapore and for being able to shape wonderful experiences for many football enthusiasts this weekend." said Ms Wong Mei Wai, Head of Marketing, Asia Pacific Breweries Singapore, the brewers of event sponsor - Tiger Beer. "We are glad to see football fans enjoying themselves at the event through the excellent mix of fast-paced football action, fun and interactive activities as well as the chance for to enjoy beer and have fun with friends at the Tiger Football Stadium." she added. Following the Tiger Street Football event in Singapore, it will move regionally to Bangkok, Thailand (May); Guangzhou, China (July) and Ho Chi Minh, Vietnam (August) before the Grand Finals in Kuala Lumpur, Malaysia. At the Grand Finals, the top team from each local leg will have the chance to fight it out to be the Tiger Street Football Champion and win the coveted top prize of USD30,000. 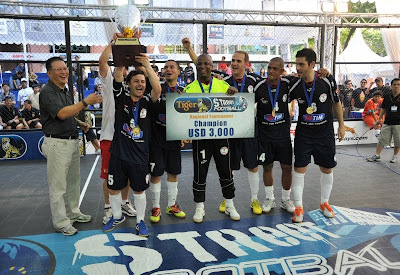 For full tournament results and information, log on to www.TigerStreetFootball.com.sg and http://www.facebook.com/TigerFootballSG.